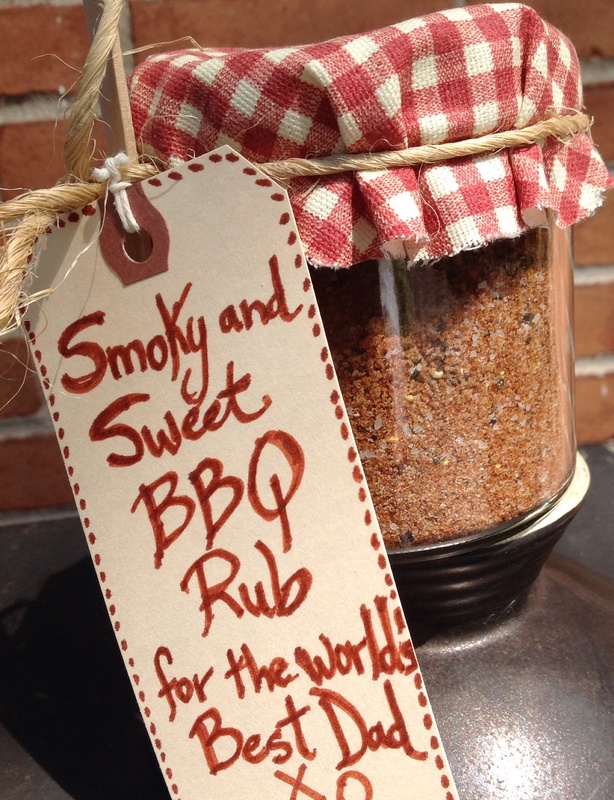 Spice rubs really enhance the taste of grilled foods. They are a staple in our kitchen and enjoyed year round. This particular blend has been a favorite and we make it in big batches to give away as gifts throughout the summer. It is the perfect marriage of smoky and sweet. The sweetness comes from brown and granulated sugars. Smoked paprika, dry mustard, garlic powder, ginger, black pepper and cumin bring in elements of smokiness and a punch of bold flavor while salt makes it all sing in perfect harmony. It is easily made from spice staples probably already in your pantry. Southern Living magazine suggests the rub should be used within a month. We use it over several months and store it without problem in an airtight jar in a spice cupboard. This is fantastic on pork, chicken, beef and salmon. It is a great gift idea for Father’s Day for the grill master in your family. As hostess gifts throughout the summer months, it is always a hit. Go ahead, put some spice in your life! Method: Combine all ingredients. Store in an airtight jar. Use 1T of spice mix per pound of meat. Let sit 30 minutes before grilling. Great on pork, poultry, beef or salmon. Makes 1 cup. For presentation I cut a masculine fabric round to cover the lid of the jar holding the spices. I tied this with twine and added a bamboo spoon. I created my gift tag free hand from a simple manila tag from Staples, writing on both sides. A charming presentation appropriate for the recipient will elevate the gift and make it worth the effort. 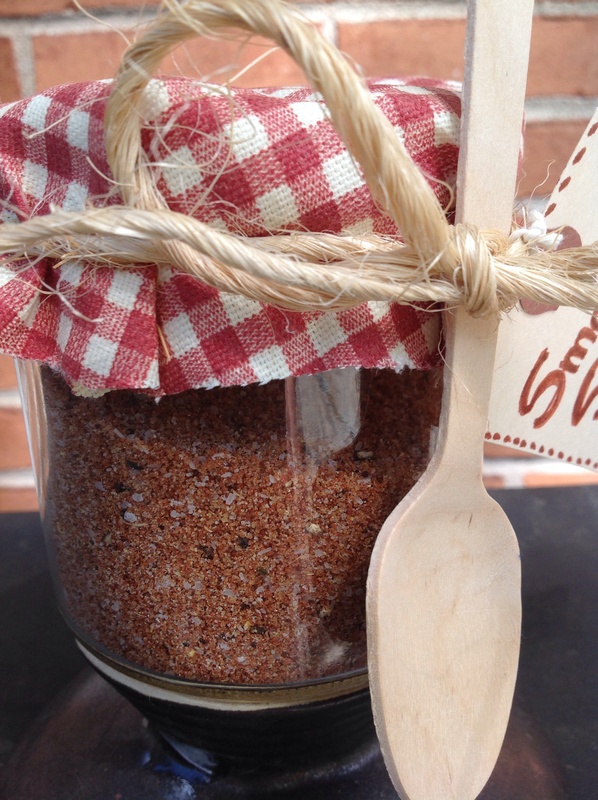 Craft stores sell great hinged jars that would also work well for gifting this spice mix. Here’s wishing you smoky-sweet grilling all summer long! 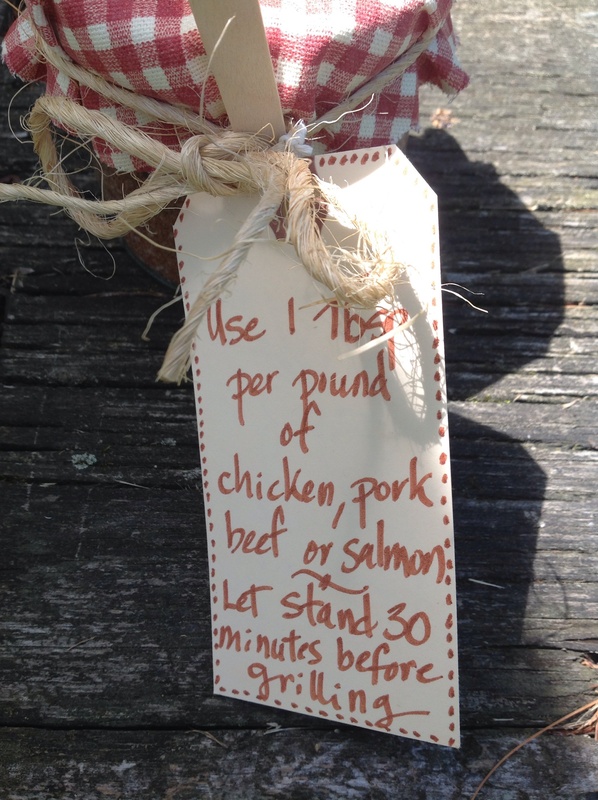 This entry was posted in Edible gifting, Recipes and tagged bbq spice rub, brown sugar, cumin, garlic powder, Ginger, Kosher seasoned salt rub, smoked paprika, Spice rub, spice rub for beef, Spice rub for grilling, spice rub for pork, spice rub for poultry, spice rub for salmon by Johanne Lamarche. Bookmark the permalink. 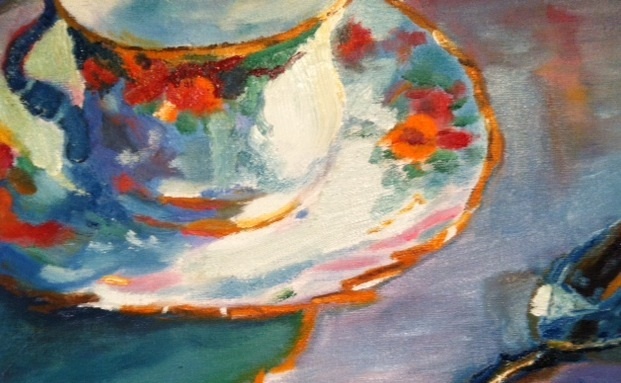 There seems to be a technical problem with this post, hence the reason to reblog it. Sorry to send it out twice! Pinning! As you may know, Kansas City is THE barbeque town, and I always love a good rub. I’ve been making my own using different recipes for years so that I can decrease the amount of sodium for our health’s sake. (We both have stupid hypertension!) I’m going to give this one a run! Thanks! I hope you can reduce the salt in this the mix without affecting the great smokey taste to suit your needs, Alycia. It is the smoked paprika that imparts the smokiness. Enjoy!!! !